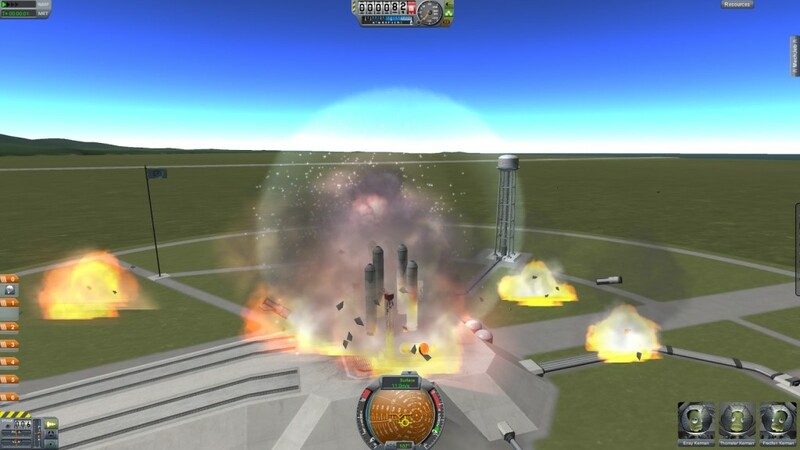 I’ve sworn off Kerbal Space Program in a fit of frustration. It’s an impressive game simulation, even more so because it’s still in development. It’s one of the most challenging games simulations I’ve played—a supremely technical experience that rewards the intellectual effort you put in to it (to a point). It also rewards (to a point) your ability to realign your spatial awareness and twitch your keys accordingly to control your potential spacecraft. And though technical, it’s also quite beautiful and more than a little cute. Your mission is to hurl tiny green googly-eyed people into a space vista that is often quite pretty. I really like the music that accompanies leaving Kerbin’s atmosphere, which is as wide-eyed and awestruck as music can be. But somewhere along the way Kerbal Space Program also redefines “tedious”. To be fair, much of my frustration is my own fault. For instance, during one spectacular waste of a day I failed to realise that my spaceship’s trajectory would miss the intercept with the planet I was aiming for. I then failed to realise that waiting for another intercept while in an elliptical orbit around the sun was utterly futile. I know, I know… If I’d played it less like a noob I’d have had more fun and left fewer Kerbals aimlessly drifting through space. Poor things. But the fault can’t be entirely mine; Kerbal Space Program can be genuinely slow-paced, as any supremely technical experience open to noobs behind computer screens must be. Creating spaceships is best done either a) painstakingly, or b) recklessly and with explosive intent. Orbital manoeuvring is done in precise, slow-moving increments. And confusingly, everything in between creation and orbit relies on twitch reflexes and a gymnastically bendy spatial awareness. All the pains you take building a ship can come to naught in a millisecond at 11,000m when you twich down-left instead of down-down-twist-right. Like Sisyphus, it seems you’re cursed to push your boulder-sized collection of fuel tanks into space, watch it plunge back down/miss its target/hit its target rather too hard, and repeat ad infinitum. I think there’s an element of this in all gameplay. Load -> play -> die -> load -> play -> … Win one race just to start another… Quest after quest, match after match, character after character, game after game… The cyclical gameplay experience has caused a bit of a stir as it leaked into the outside world over the last decade (see the film Run Lola Run for an oft-quoted comparison to gameplay). But within the game world it can still test your patience. Some games use this well, like the maddeningly addictive Dark Souls: Prepare To Die Edition, and those racing games that strike a good balance between racing and car setup like Gran Turismo or the Forza series. If, on the other hand, the recurrent experience gives you time enough to ponder, and your ponderings turn from the game to the recurrent experience itself, you can lose sight of why you’re playing. Gameplay becomes as banal as washing your hair or putting out the garbage. At which point you might as well do those things because they’ll be quicker and more beneficial to your mental wellbeing. I’m no stranger to slow gameplay, and often I prefer it. And I don’t mind going back to repeat something if I noob it up a bit. But there’s a limit, you know?